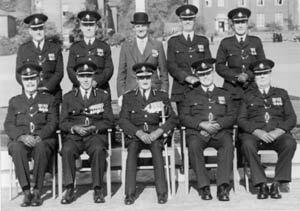 On the 30th May 1957 the Bucks Constabulary held its Centenary Parade at RAF Halton. Over 600 police officers were present at the parade which was described as the 'their proudest day'. The Duchess of Kent carried out the inspection. Amongst the 600 police officers were two police motorcyclists, ten traffic patrol cars, dog handlers, members of the Womens' Police Section, Special Constabulary and a number of retired police officers. Two police officers dressed in the uniform similar to that worn 100 years ago stood each side of a dais where the Duchess of Kent and the Chief Constable stood during the parade. The Duchess said, "The country should take great pride in all those associated with the police force". with the Chief Constable and the Duchess of Kent. 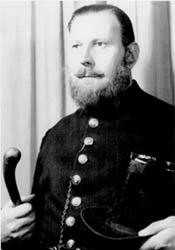 Police Constable 70 Ernest Sydney Herbert. Women Inspector Danby leading the contingent.